Enter this giveaway to win this beautiful bird necklace made by Layla Amber. Good luck! 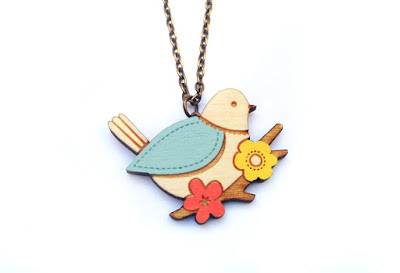 That is a lovely bird necklace! Adorable! My favorite is the cardinal, but we enjoy whoever shows up at our feeders! Pretty prize! Peacocks are my favorite birds. My favorite kind of bird is a cardinal. My favorite birds are definitely peacocks. I loveeeeeeee birds! Owls have been my favorite since childhood but I love all birds. My two parakeets are my favorite birds. They're a bonded pair - Lilly & Max. So cute! The hummingbird is my favorite. The Rainbow Lorikeet is my favorite. Love the Mountain and Western Bluebirds that visit us in the spring and summer!